'Park Village East, Regent's Park', London, 1827. 'View in the Regent's Park', London, 1828. Park Village, London, 26 August 1836. 'Mr Bishop's observatory from the north east', Twickenham, Middlesex, 1869. "Ferranti group photograph, Regent's Park, London, 1956." 'Macclesfield Bridge, Regent's Park', London, 1827. 'Scene of the Explosion on the Regent's Canal', London, 2nd October 1874. 'Double Lock and East Entrance to the Islington Tunnel, Regent's Canal', 1827. The double lock and east entrance to the Islington tunnel, Regent's Canal, 1827. 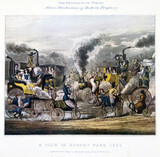 'The Progres of Steam - A View in Regent Park 1831', 1828.